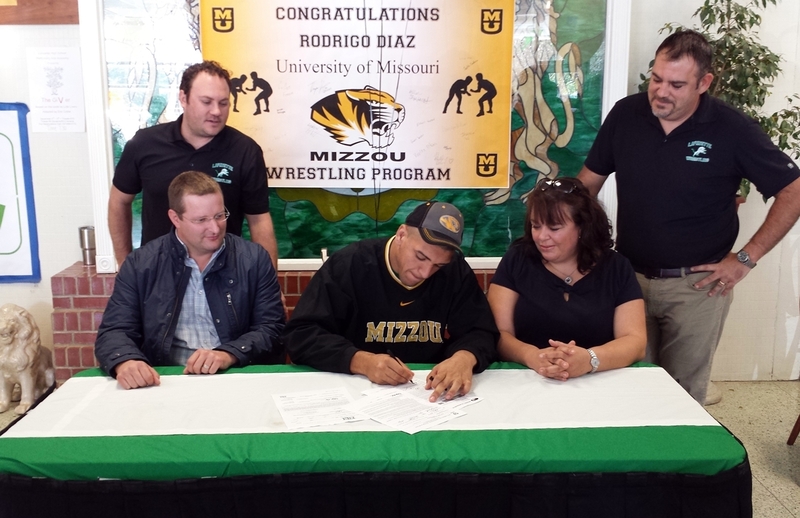 Lafayette senior Rodrigo Diaz signed to wrestle for the NCAA Division I Missouri Tigers on November 11th. The Tigers are currently ninth in the NCAA Division I rankings. Diaz was a Division I state runner-up in 2015 and placed third in 2014 for the Lions, both times in the 220 lbs. weight class. He posted a 45-6 record during 2014-15, with four of his losses coming from undefeated 2015 Division I state champions Ethan Eisenhardt and Kendrick Jones (two apiece). One other was a disputed disqualification call at the Louisiana Classic and the other was a very early season match which he avenged several times later. As a sophomore in 2013-14 Diaz was 40-6. Four of the six losses were to C.E Byrd's undefeated Division I state champion Quinn Gilliam. Another one was to Jones, and one was a 2-1 loss that he later avenged by a score of 12-1. Diaz has won Sulphur's Ronnie Suarez District 5A Tournament, the Jacob McMillan Invitational and the Lafayette Metro Tournament twice each. As a sophomore he also won the Teurlings Catholic Rebel Open. He finished as a runner-up twice at the Ken Cole Invitational and third at the 2014 Louisiana Classic. Diaz will open his 2015-16 season at the Ronnie Suarez District 5-A Tournament held at Sulphur High School , again at 220 lbs., where he should be the top-ranked wrestler in Louisiana once he steps onto the mat. The following article, written by Kevin Foote, appeared on the Lafayette "the advertiser" Website on November 12th, was was copied with his permission. Sometimes, you set a goal, work hard to achieve it and it happens. No one believes that more these days than Lafayette High senior wrestler Rodrigo Diaz after signing a national letter of intent Wednesday to continue his career with the Missouri Tigers. Diaz’s delight and amazement is well-founded. In the world of elite Division I wrestling, Louisiana doesn’t even approach the level of being a hotbed for recruiting that it is for sports like football, baseball and basketball. It’s the kind of signing that’s big for the entire wrestling community in the Acadiana area and throughout the state. Lafayette High coach Brandon Billeaud said he’s thrilled to see Diaz get this opportunity. “He’s getting a great opportunity,” Billeaud said. “I’ve gotten to know (Missouri) Coach (Brian) Smith. He’s a great guy. We’re about family in our program at Lafayette High and that’s exactly how Coach Smith runs his program at Missouri. Diaz’s example is certainly one for his teammates to emulate, no matter what their goals are. As the story goes, Smith came down to work a summer camp at Teurlings Catholic in 2014. Masson had brought a large group of his Rebel wrestler to Smith’s camp at Missouri and developed a relationship on that trip. During his visit to Lafayette, Smith spotted Diaz. The two met and Diaz’s interest in Missouri’s program was sparked. First, he wrote letters to every coach on Missouri’s staff and asked what he needed to do to garner a scholarship offer. The message was to attend Missouri’s summer camp this past summer. The problem was the money. Already involved in football, wrestling and track and field, Diaz’s parents told him he had to get a job and pay his own way. Not only did Diaz attend Missouri’s camp, but earned the ‘Hardest Worker’ distinction and caught Smith’s eye once again. Billeaud wasn’t surprised by how well Diaz fared in Missouri this past summer. “Rodrigo just loves the sport, and he has a great work ethic,” he said. “I think Coach Smith just sees all of this untapped potential from a kid who wants to work and is willing to accept coaching,” Masson said. Even after everything he went through to impress Missouri’s staff, Diaz didn’t expect it to work. Diaz didn’t begin wrestling until his freshman year at Lafayette High. In three years, he’s got a 128-34 record, placing second and third at state. “Now that I’ve signed, I can focus on leading my team this year and go all-out to try to win the state championship,” he said. Missouri plans on using Diaz as a heavyweight after red-shirting. Diaz said the goal is to get in the 260-pound range.